The Spurs overcame 14 lead changes, 12 ties, and several recent demons to beat the Pacers. The Spurs came to Indiana looking to bounce back from yesterday’s debacle in Madison Square Garden. 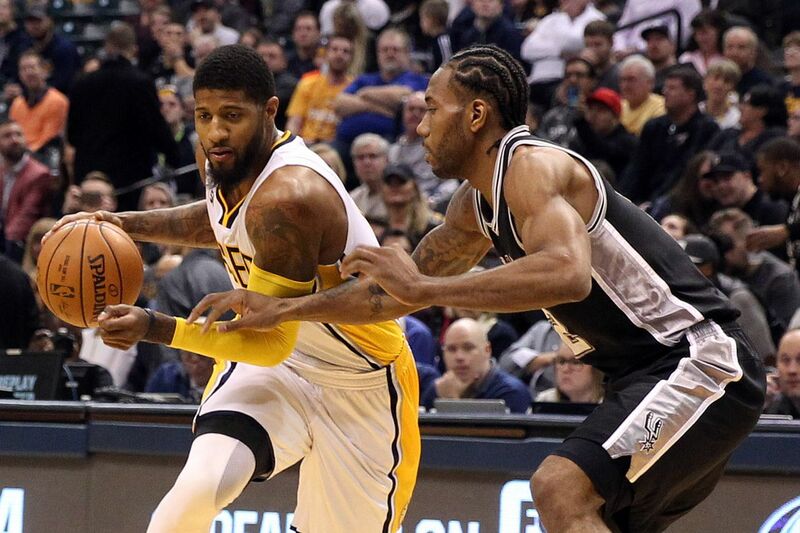 After a sloppy first quarter-and-a-half, the Spurs finally showed some signs of life beyond Kawhi Leonard and got the win against a gritty and rapidly improving Pacers team. The offense started a little stagnant, with individual shooting taking more precedent than team play. A Dewayne Dedmon alley-oop from Danny Green got the Spurs up 13-9, but a quick 7-0 run from the Pacers prompted Pop to call a timeout with 5:20 left in the first quarter. Indy continued to get whatever they wanted on offense, especially Paul George and Myles Turner, who scored nine points apiece in the quarter. Jonathon Simmons returned from illness to provide a last minute spark, but it was spoiled by a buzzer-beating three by serial Spurs-killer’s Monta Ellis. Still, the Spurs were somewhat fortunate to only trail 31-26 at the end of the quarter. Sloppy play continued to mar the start the second quarter, and the Pacers stretched the lead as far as nine. Leonard remained the Spurs primary source offense, and Pop called two timeouts in the first five minutes to try and get his team going. The second timeout seemed to do the trick as the effort and intensity picked up on defense, which translated to some slightly better offense (if still a little disjointed). A Patty Mills three with 2:06 left tied things back up at 46, and another a minute later gave the Spurs their first lead since early in the first quarter. The half ended with everything knotted up at 49-49. Leonard led the Spurs with 13 points, and Dedmon had 8 rebounds. Both teams opened the second half shooting well and exchanged the lead multiple times with each always having an answer for the other. Pop called a timeout with 5:22 left in the quarter after a miscommunication on defense allowed an open three for George to give the lead back to the Pacers, 66-64. Kyle Anderson came in and immediately made a difference, blocking a shot that led to a Leonard three and assisting on a David Lee and-1 to get the Spurs up 78-72 with two minutes left. It was part of an 11-0 run got the Spurs up by nine before the Pacers got it back within four, 83-79, heading into the final frame. The Sloppy Spurs returned to start the fourth quarter, and the Pacers took advantage to regain the lead 85-84 with 9:23 left. A second straight steal-and-slam capped a 9-1 run to start the quarter for the Pacers before the Spurs tied it back up again, but it was short lived. Indiana got the lead back up to 95-91 with 5:16 left before Green answered with a three. Two straight baskets by Leonard gave him his fourth 30-point game in a row (and 19th overall) and the Spurs a 100-97 lead with under three minutes left. LaMarcus Aldridge finally abandoned his failing jumps shots and got physical down low, resulting in an and-1 and two more FT’s to expand the lead to 105-100 with 0:52 left. The Spurs made their FT’s down the stretch and won 110-106. Check back later for more on this one. The Spurs return to action on Wednesday against the Orlando Magic for their final game before the All-Star break.